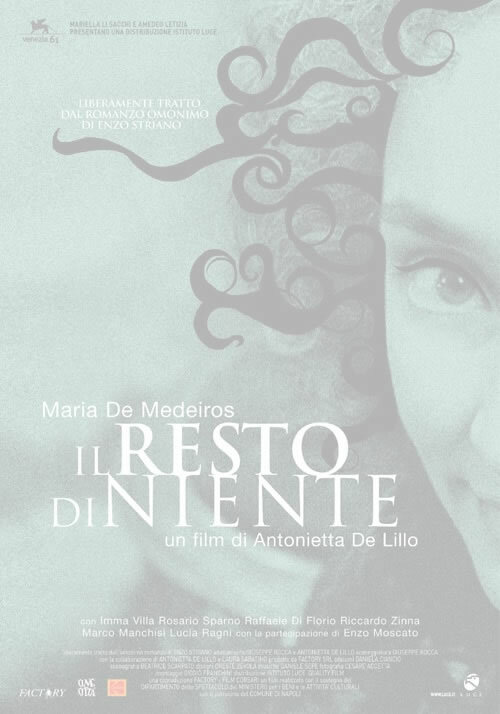 Enzo Striano's novel Il resto di niente (The remains of nothing ) has inspired a movie, Il resto di niente ( The remains of notihing ) by the Neapolitan movie maker Antonietta De Lillo, with the portuguese actress Maria de Medeiros portraying the main chapter of the novel: Eleonora Pimentel de Fonseca, and with a crowded cast of Neapolitan actors. It is an intimate, elegant and sophisticated movie, very faithful to the spirit of the novel and, for these reasons, it has been very appreciated by critics and public and has been appointed several awards. «A serious, intensely scripted historical biopic set amid the 1799 revolution in Naples, "The Remains of Nothing" describes the short-lived Neapolitan Republic, proclaimed on the coattails of the French revolution. Director Antonietta De Lillo ("Matilda") obviously has great empathy for her little-known heroine, the aristocratic revolutionary Eleonora Pimentel Fonseca, winsomely portrayed by Maria de Medeiros. Story, based on a cult novel by Enzo Striano, runs more on ideas than money, but budgeting problems are imaginatively solved. Though treatment looks too subtle for Italian fans of made-for-TV romantic historical fiction, limited theatrical auds should be draftable in Europe before pic hits the small screen. As the curtain rises, a gray-haired Eleonora is about to be hanged for treason. Flashbacks race through her birth in Rome to her noble but impoverished Portuguese family and their move to Naples when she is a child. As a sensitive, highly educated young woman, she reads poetry to the crass Bourbon king who rules Naples and is married off to a carousing, violent count who beats her. She moves to his crumbling palazzo full of hostile relatives and servants, including the maid Graziella (Imma Villa), his mistress. A first demonstration of Eleonora's courage comes when her only child dies and she leaves the brute. Historical events now fly by fast and furiously with little explanation. Eleonora and her intellectual friends frequent the court while they plot an uprising of the people. She is arrested and thrown into a cavernous women's prison, but liberated when the French navy seizes the city. When the republic is proclaimed, she becomes the editor of a newspaper aimed at explaining the revolution to the masses. Their disinterest in politics ultimately brings the curtain down on this chapter of history; Eleonora is arrested once more and condemned to death. Closer in its utopian tone to the Taviani brothers (particularly their recent TV movie "Luisa Sanfelice") than to "Barry Lyndon," De Lillo's and Giuseppe Rocca's screenplay isn't afraid to debate Jacobin ideas of the time, like the quest for happiness as a universal right. Backed up by a standout local cast, Medeiros (who has directed a revolutionary film of her own, "April Captains") is a welcome contrast to the romantic heroines of most historical fiction and a convincing choice for an outspoken thinker who defies the monarchy in the name of her convictions.» [Deborah Young , « Variety » , 11 october 2004] .